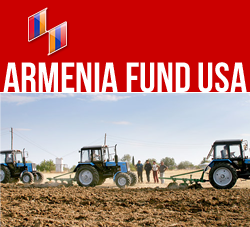 NEW YORK, New York — With a festive ceremony held at the Stepanakert Retirement Home on September 24, the Hayastan All-Armenian Fund unveiled the facility’s newly renovated and furnished second wing. The renovation project was made possible by Moscow-based industrialist Armen Shakhazizyan — a top benefactor of the fund and founder and CEO of the Luding group of companies — with additional support from the government of Artsakh. The ribbon-cutting ceremony was attended by Bako Sahakyan, president of Artsakh; Archbishop Pargev Martirosyan, primate of the Artsakh Diocese; Ashot Ghulyan, chairman of the Artsakh National Assembly; Ara Vardanyan, executive director of the Hayastan All-Armenian Fund; and benefactor Armen Shakhazizyan; as well as several high-ranking officials and numerous guests. In his opening remarks, Lenstan Ghulyan, deputy minister of Artsakh’s Ministry of Labor and Social Affairs, thanked the Hayastan All-Armenian Fund and Armen Shakhazizyan for their support of critically important projects benefiting senior citizens in Artsakh. The honor of cutting the red ribbon was given to Armen Shakhazizyan and Irina Sargsyan, director of the Stepanakert Retirement Home. “This is a day of great significance for me,” Shakhazizyan said as he addressed the attendees. “We joined forces to refurbish the home of our elderly compatriots, as I believe that participating in benevolent projects in the homeland must be our supreme goal.” Shakhazizyan added that he will also sponsor the complete renovation of the Stepanakert Conservatory, a project set to launch in the near future.